If you suffer from dark eye bags like me, you'll love this post. 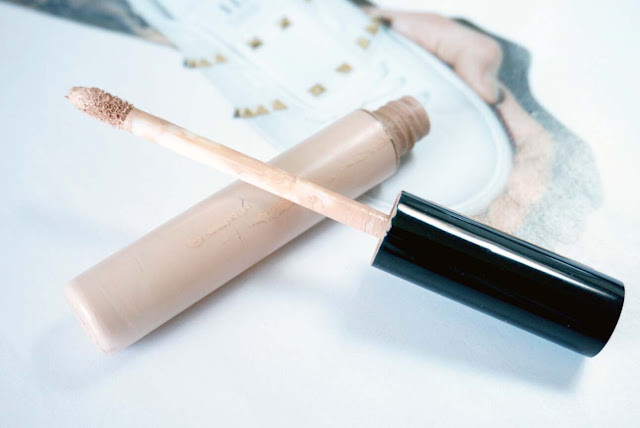 Today I'm sharing all the concealer's that I have used to cover them up. I have been on a crazy concealer binge the last couple of months to find the ideal concealer combination to help cover up my blue/purplish eye bags. When I first started using makeup I remember using the Collection Lasting Perfection Concealer. It is a high coverage concealer but I find that it creases under my eyes and the formula very dry. The undereye area is a very sensitive place and it feels a bit uncomfortable for me. I know that loads of people love this but it's not my first choice to opt for. 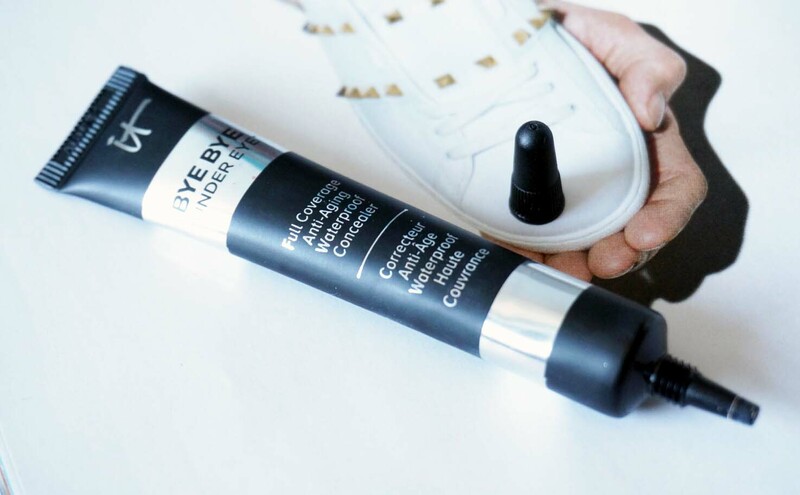 An affordable drugstore cult product is the Maybelline Eraser Eye Concealer. I have been using this for years. I find that coverage is light-medium with a buildable formula. This alone is not enough for the coverage I like, so I do layer up my concealer. I may wear up to 2-3 different concealers just underneath my eyes but sparingly. I recommend this to all my friends who wants something affordable and easy to cover their under eye blemishes. 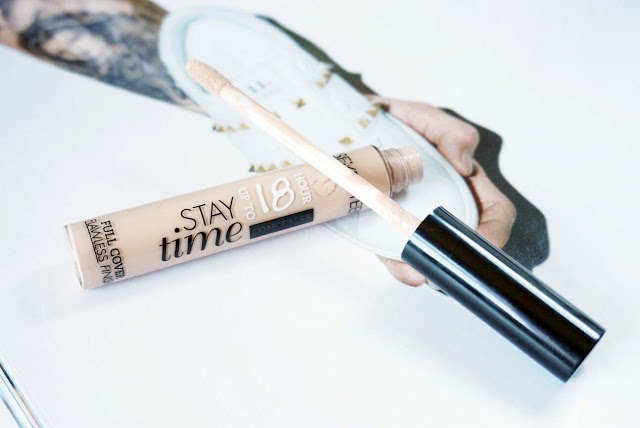 Another drugstore concealer is the Seventeen Stay Time Concealer - this is a boots brand. It is medium coverage with a creamy formula. If you like the Collection Lasting Perfection Concealer but find it a bit too dry, try out this one. It has a hydrating formula and blends like a dream. 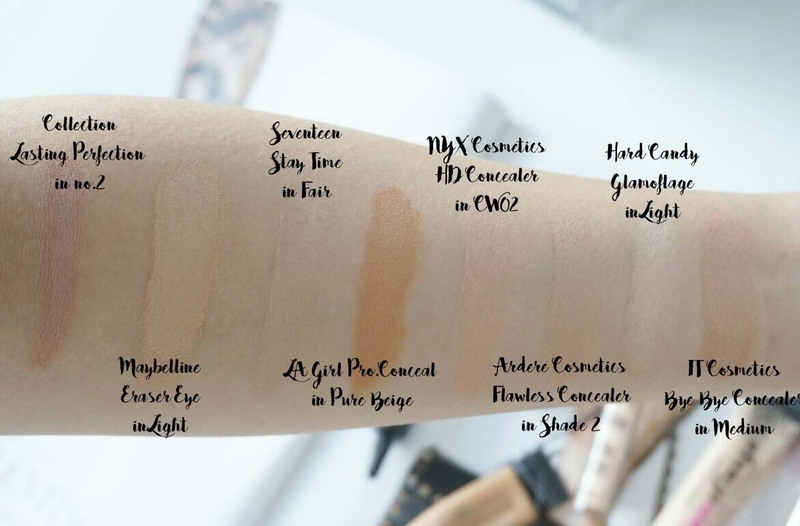 The concealer is marketed as a full coverage concealer but I don't find that it covers my scars quite well - I have this scar on the back of my hand which test out all sorts of concealers and the concealer does not cover it after 2 layers. I use this with the Maybelline Eraser Eye Concealer - most likely used before my foundation application. I had to get the LA Girl Pro Conceal HD High Definition Concealer when it became available on BeautyCrowd (which is now closed), I heard it was a dupe of the MAC Pro Long Wear Concealer. This claims to be a full coverage concealer but I find it only to be a light-medium. I've swatched the MAC Pro Long Wear Concealer and it is no way a dupe. The coverage is quite disappointing but it's great for colour correcting since the shade Pure Beige is quite a bit darker than expected. The applicator makes the product very difficult to distribute - I have to use both hands to squeeze the product out. Most people use this as a contour product which works amazing but under the eyes, it does not provide much coverage unless you get a highlight concealer shade. 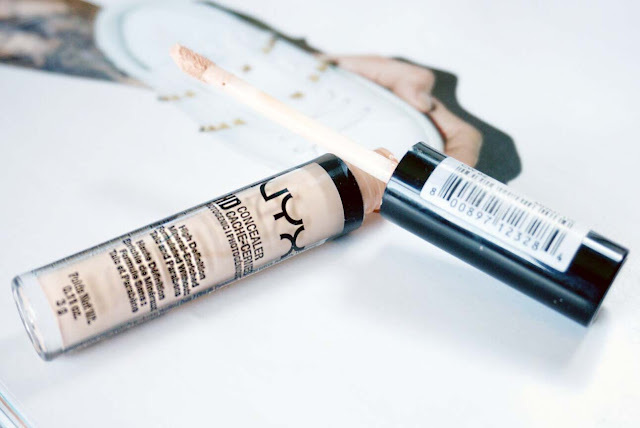 A recent purchase is the NYX Cosmetics HD Concealer. I've heard it's a dupe for the Nars Radiant Creamy concealer but I've yet to try it personally. I bought this before I went on my holidays and I find it a bit too light for me right now. This is a medium-full concealer with a creamy formula and is a beige concealer with pink undertones. The shade I picked is CW02 which is Fair since I use all my undereye concealers as a highlight. I find this great to cancel out my dark circles and only use this underneath my foundation since it doesn't work as well on top of my foundation because of the pink tones. This concealer dries really fast, therefore I find it difficult to blend sometimes. I'm not a fan of the applicator as I feel that the dove foot applicator does not pick up enough product at the tip, therefore it slightly hurts when I apply under the eye area. I may repurchase this as it does cancel out some of my blue/purple tones. It Cosmetics was a brand that we couldn't get in the UK for a very long time but now it's available on QVC. I researched online and found that there was a dupe for the It Cosmetics Bye Bye Undereye Concealer before it became available on QVC. It is the Hard Candy Glamoflauge - a full coverage concealer - I bought mine off Ebay for £12.95 and it arrived quickly. Now don't get me wrong this is 100% a heavy duty full coverage concealer but I hate it. First of all, whenever I squeeze the product out of the tube the product is separated - so you get a watery section. I guess that's why it feels quite creamy when you blend it but this creases under my eye and I suffered a makeup malfunction. It became very cakey under my eyes and I accidently scraped it off with my nails when I moved my hair out of my face and I couldn't save it - I went to work with one eye concealed and the other not. The other point is the smell - I hate it, it smells straight up like plasticine and I can't stand it. Now if you watch YouTube you might have heard of Amena who has created her own makeup line Ardere Cosmetics with Paula - a makeup artist. I was contacted by them to try out some of their products and I have discovered a GEM: the Flawless Concealer. This is my 100% everyday full coverage concealer which I use under my eyes. The consistency is very creamy, hydrating and buildable. It does not crease and there are 5 shades, which I also use for colour correcting and brightening. A little amount of this goes a long way and I wore this in Hong Kong and Korea and it did not budge. This is 100% a concealer that I will continue to buy and can not recommend enough. Lastly, I talked about the It Cosmetics Bye Bye Undereye before. I purchased this in the shade light which I returned as it was too light - I didn't want to waste my money on a concealer that I was not going to reach for and it is quite pricey. I went and reordered a Medium and I like that highlighted/brightened undereye look, so I was a bit disappointed that Medium matched my skin tone and did not give me that. There isn't a shade in between so if It Cosmetics are reading this please to formulate one. Never the less this is a fantastic undereye concealer that can definitely get rid of the blue/purplish undertone without a doubt. 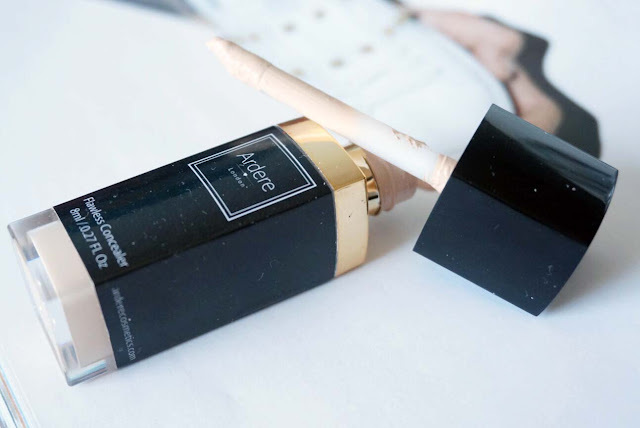 I also use this to pinpoint blemishes across my face.To brighten up my eyes after I've concealed, I use the Ardere Cosmetics Flawless Concealer to re-highlight. Together they are they perfect undereye concealer for me. 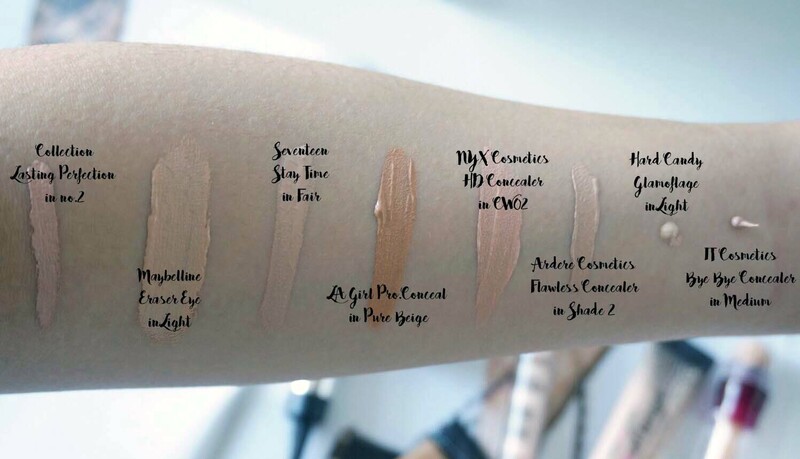 I've provided swatches of the 8 concealers. The first photograph is the concealers not blended and the second blended. I hope you've enjoyed this post and found it useful. If you have any recommendation please let me know and tell me your favourite undereye concealers. 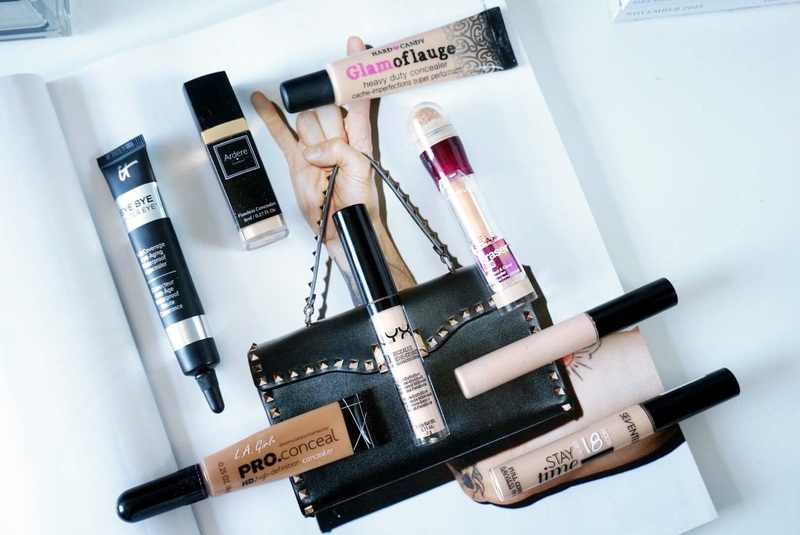 Definitely need to try some of these concealers out! I've found no concealers work under my eyes, whatever I use creases, wish I could find one that will actually do the job without creasing! I have the NYX concealer and I personally adore it. Great post, I am looking for a new concealer and this has really helped, thank you!